For other sky shots around the world, please visit the home of SkyWatch Friday. that tree is so green and pretty, love the blooms it's got going on. Spring! So pretty!! Leaves AND blossom - lucky you! Lovely lovely. I love that flowers. It remind me of the summer. Beautiful! Love all that green with the sky peeking through. Beautiful blossoms, flowering trees are some of my very favorites. It's always fun skywatching behind nature! Love this! Thanks to everyone for visiting and to answer the question, the white flowers are a dogwood but the dogwood is growing towards and into an oak tree which has leafed out. Beautiful flowers under the blue sky. Superb, Carver! Fantastic composition to show the very best of spring beauty! Love the tree, the flowers against the sky! Have a wonderful weekend! Its a beautiful framed photo! perfect combination...new green leaves and flowering trees with a backdrop of Blue sky. Oh this is beautiful, so pretty. Woiw, this is already very green! Lovely shot. Spring is really here. Great shot!! Happy weekend and enjoy! Wowwww..this is so beautiful. I love the flowers. Looks like it was a beautiful day. Have a great weekend. The flowers are lovely with the serene blue sky in the background! Awesome! I really like this! Amazing blossoms...great light...just GREAT! Your foliage is so lush. And the blossoms--just beautiful! 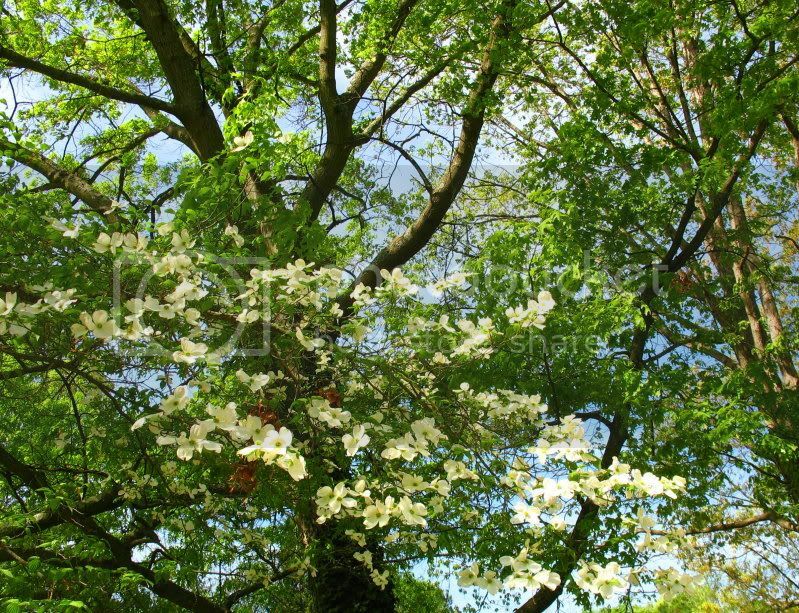 Gotta love that dogwood too! Great focus shot with vibrant colors. the srping did not come yet. This would definitely make a wonderful spring greeting card! Oh, how I miss the flowering dogwood!